The twiglets have come and gone for another year, with the results as shown below. There were over 500 voters in this years' awards (more than double last year) so we've got a pretty good cross-section of online WL viewers represented here! (so if any WL production staff want a good guide as to what goes down well with their audience...!). The awards were presented in an IRC ceremony on January 26th 2001 and the transcript is available. Congratulations to all the winners, and remember - with over a decade of show to choose from, just getting nominated is an amazing feat! Greg a winner by quite a margin here, joining long-time regulars Ryan and Colin. Next year we might see quite a fight between the old and the new favourites of Tony and Wayne! Extremely close competition between the leaders here, with the rest all not too far behind. Green Screen may be a strong contender in future years as Colin makes it his own... Some classic hoedowns have improved its prospects incredibly since a couple of years ago when it was amongst the most-hated games. Superheroes takes it out, perhaps being more consistently funny than some of the others. The Colin hoedown barely missed out last year, and still stands as a classic. Wayne's prominence in songs has earnt him many nominations, with the dodgy stripogram song styles and the hilariously screwed-up 'You've Got Sole' coming out equal second. I haven't seen this winner yet, but from the number of nominations, it must be some game! 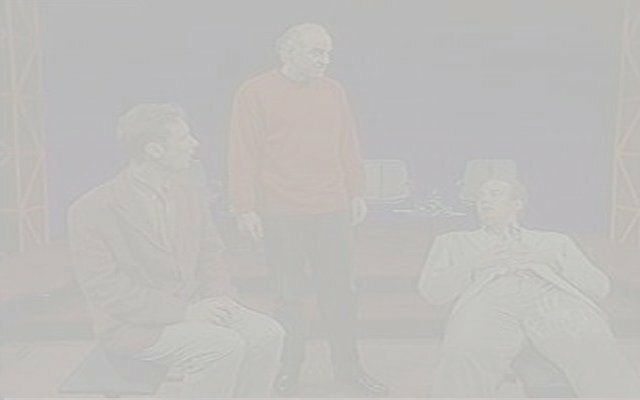 I have seen all the rest, and they are indeed truly classic sketches from a wide range of the show's history. Previous winners: Tony realises Rory is imitating him in PQ & Tony's F*** Off! Tony loses his stranglehold on this category, but he and two other all-time greats could not hope to compete with some hilarious moments still fresh in the memory. The 'Best Of' episode provided an all new set of unexpected events on the show, and coverage of the Melissa incident like we probably wouldn't have seen before (except maybe in 'bits that went wrong'). Previous winners: This Courtroom is a Mochrie! & One of us might not come back alive... / I hope it's you! Clive: Well hurry up then before my funk gets stale! Drew: What holds you to the earth? Greg: Why my love for you Drew! Ryan: I don't really care for men. I just like to tease 'em a bit. Steve: Would you care for some dripping? Caroline: No thanks - I'm doin' me own! The word 'classic' is getting overused in these comments... but Ryan and Colin banter has always been a source of some great jokes. Second to that we find Greg finding a new target for his historical & hysterical anti-host jokes. Again these moments come from points across the span of the show and come from some great games. And you thought you had to actually say something to win 'best reading' :) Some of these other nominees have been in there year after year and might actually win eventually! WINNER: SEEING YOU NAKED CHANGED MY LIFE. Always keep a jellyfish in your handbag. I never knew you were inflatable! It's time for the royal spanking! Seeing you naked changed my life. Tickle me till I squeal! Well, it would, wouldn't it? The lines here are definitely some of the weirdest that have ever appeared on the show (apart from what Colin sometimes comes out with...) and the voting was fairly balanced across them. I think we all needed a breathmint after that one. A good scene from a hat usually takes both a good audience suggestion and some quick thinking from the performers - both of which are evident in each of these suggestions. Extremely close voting here. Greatest Hits is a well-thought-out game giving Wayne (or others) the chance to demonstrate singing prowess while allowing Colin and Ryan to be at their weirdest and most banterish :) These nominees show both bizarreness and extremely dodgy double entendres that slipped past the censor... but I think the winner has to be one of the strangest phrases uttered on the show. Previous winners: How many scoops? 500! & Hey giant - stop peeing on the alps! Props is another good game for quickfire thinking, but Colin seems to have this category licked even though other contestants have had some great ideas nominated. It had to win eventually :) Rory does a great job and Tony's reaction is priceless. The other quirks are all great and not too far behind. How could anything beat a hair joke? Superheroes is one game where contestants really get dumped on - a chance to not only come up with an amusing name, but to force their co-performers to act it out! Hence this category features an amusing mix of insult suggestions (hair, floppy...) and just strange things that were well performed. After a very samey start, the US version has started to come up with many and varied new things for the contestants to try. This has included pop-culture references (Millionaire, Survivor & Daytime Talk Shows), more audience member involvement, and with Wayne as a regular, an expanded variety of musical games. Here we see that Three Headed Broadway Star takes it by a mile - a game which can combine good singing, hilarious comedy and which is amusingly difficult for the contestants to perform! WINNER: GREG: IT'S ALSO A CONTINENT IF YOU'RE A GEOGRAPHER! Previous winners: No luck then? (weight watchers' convention) & Don't cry - you're not that good of an actor! Greg: And any time I say naff git that means Clive! Paul: Are you bald or is your neck blowing bubble gum? Colin: He had a face like a collapsed lung. Ryan: I knew he had that metal plate in his skull... that's where all the hair had gone! Greg: It's also a continent if you're a geographer! When the award is named after you, it's only right that you actually win it at some point. Greg is well known for his insults and this one seems to have captured the imagination. Picking on the host is a long time tradition (with both old and new variations listed amongst these nominees) but there were many many other targets in the suggestions made. Again, I haven't seen this one yet but it sounds extremely weird - which is what this category is all about ;) Personally my favourite was the camera flash which threw everyone in the middle of a frantic scene; however all of these moments here have managed to confuse people for a moment or just get them wondering how the hell some of these people's minds work! WINNER: STAR OF SCHOOL NATIVITY PLAYS; AUDITIONS; AND COLIN MOCHRIE LOOKALIKE CONTESTS. COLIN MOCHRIE. Actor; comedian... just a few of his aspirations. John Sessions. As described by Doctor Spooner - 'the shining wit'. Greg Proops. Greg Proops - last happening dude left in captivity. Jim Sweeney - better half of Sweeney & Steen. Steve Steen - better seven-eighths of Sweeney & Steen. Star of school nativity plays; auditions; and Colin Mochrie lookalike contests. Colin Mochrie. The spy who loved me. Ryan Stiles. With differing styles, both Clive and Drew have managed to introduce us to the contestants in varied and hilarious ways. Clive is perhaps ahead on votes with a long history of great intros, but Drew's bizarre themes including movie and advertising references have also given some classics. Paul is yet to win his own award, but with his reputation that's hardly unexpected! Laura was close last year and has finally had her chance to stand smiling in the spotlight. Colin was extremely close behind; perhaps next year will be his turn. Previous winners: Debi's baseball outfit; Josie's Peter Pan outfit; Ryan's Neon Love Chicken shirt & Greg's suits/jackets. It's not specified whether this referred to clothes that were particularly stylish or just shockingly bad (in fact it combines both the best and worst categories of previous years). However, the appeal of the flame shoes is hard to deny - there have been many people trying to find some to buy! (try http://www.joesgarbshoes.com!). Meanwhile the rest of the standard outfits are fairly close together in runner up positions. Drew and Tony seem to be the easiest to crack-up, but watching Wayne trying to sing a song while coming up with stuff even he can't help but laugh at is just hilarious. My apologies - as last year's winner, Moving People should not have been nominated again, but it's good to see that it's still hated! :) However, If You Know What I Mean takes this category by a mile. A game that sounds reasonable in concept probably needed a lot more subtlety, a more constrictive setting and maybe some British double-entendre expertise to be successful. Thankfully, it doesn't appear to be coming back! Interesting also is the lack of song games now in this category; that aspect of the show seems to have been successfully brought up to (and beyond?) standard. I don't like this category and it probably won't be back... whereas worst game offers either a thankful "phew, it's gone" or some constructive criticism on what isn't currently working, this category just seems mean :) Some new faces here this year, and some familiar old ones... perhaps we should wonder, though, if it's better to be infamous, or just one of the many contestants who is barely remembered? :) Anyway, George finally takes the award out, proving perhaps that you can't just assume that anyone will be good at the show without an audition. I do sometimes wonder if this category truly represents those who have improved; or just those who are currently performing well. IMO, most of these guys were pretty good when they started... but then I suppose only those who have been around for a while can be considered to have 'improved'. Drew has done well, which is probably good considering his worst contestant award of last year ;) Congrats to Chip who is back and doing a great job.